The thing is, none of it – not last month’s deal, not Obama’s 2010 reforms – mattered that much. No doubt, seeing rates double permanently would genuinely have sucked for many students, so it was nice to avoid that. And yes, it was theoretically beneficial when Obama took banks and middlemen out of the federal student-loan game. But the dirty secret of American higher education is that student-loan interest rates are almost irrelevant. 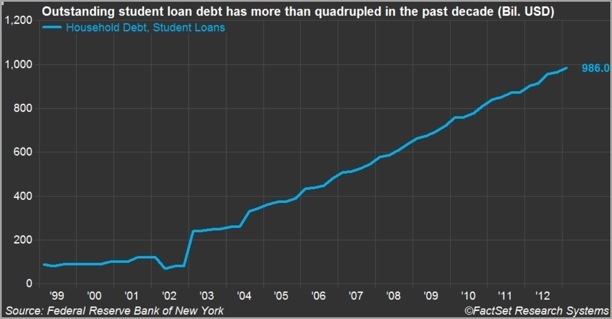 It’s not the cost of the loan that’s the problem, it’s the principal – the appallingly high tuition costs that have been soaring at two to three times the rate of inflation, an irrational upward trajectory eerily reminiscent of skyrocketing housing prices in the years before 2008. Tabbi is right that the rise in tuition rates is the real underlying problem; while he identifies the student loans as a “federal subsidy”, he doesn’t take the last few steps and acknowledge that cheap money leads to inflation (one of Reynolds’s main points). He also doesn’t really touch upon the extraordinary growth in administrators (cf. the University of California) as a major factor. The “bankruptcy reform” that removed student loans from being eligible is probably one of the vilest acts of Congress in recent years. Revoking the provision would probably do more to stimulate the economy — and, frankly, get student loan rates and qualifications back in line with reality, and thus exert downward pressure on tuition rates — than anything else Congress could do. ..bruce..